"Microsoft PowerPoint Theme and Slide with group of five flutes of champagne on festive table" Help the audience digest your thoughts. Our Five Champagne Festival PowerPoint Themes And PowerPoint Slides 0511 give you the facility. 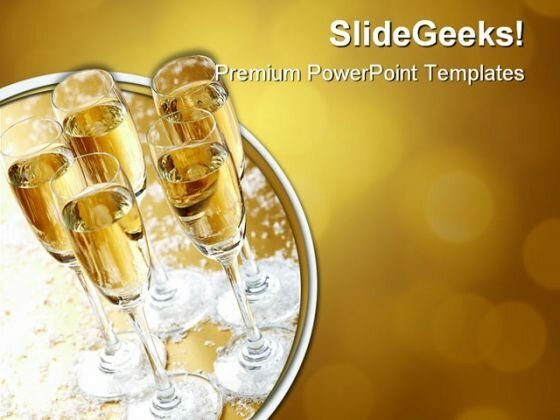 Get people out of bed with our Five Champagne Festival PowerPoint Themes And PowerPoint Slides 0511. Just download, type and present. 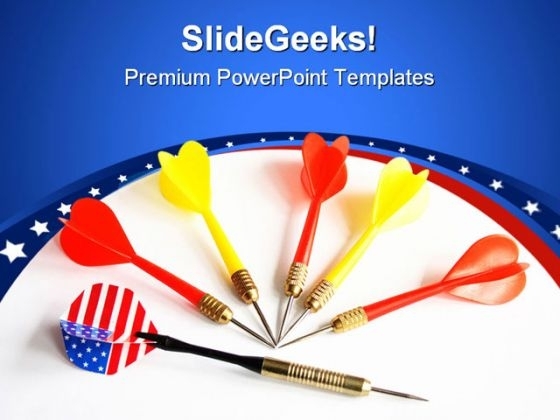 "Microsoft PowerPoint Theme and Slide with darts for game" Attain stardom with our Darts Americana PowerPoint Themes And PowerPoint Slides 0611. You will come out on top. Performance evaluation is easier with our Darts Americana PowerPoint Themes And PowerPoint Slides 0611. They help you assess results accurately. 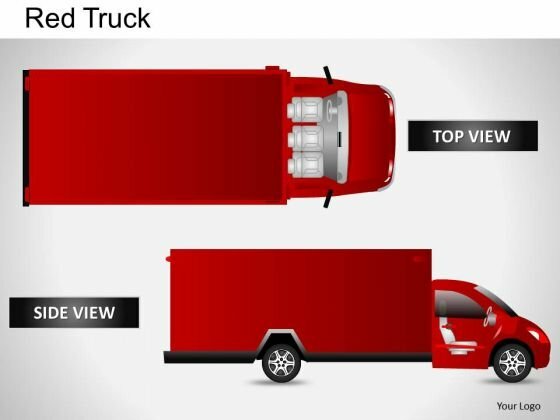 Architecture Red Truck Top View PowerPoint Slides And PPT Diagram Templates-These high quality powerpoint pre-designed slides and powerpoint templates have been carefully created by our professional team to help you impress your audience. All slides have been created and are 100% editable in powerpoint. Each and every property of any graphic - color, size, orientation, shading, outline etc. can be modified to help you build an effective powerpoint presentation. Any text can be entered at any point in the powerpoint template or slide. Simply DOWNLOAD, TYPE and PRESENT! Venture into the unknown with our Architecture Red Truck Top View PowerPoint Slides And Ppt Diagram Templates. Your thoughts will move ahead sure-footedly. Customise your Architecture Red Truck Top View PowerPoint Slides And Ppt Diagram Templates as per your choice. Discover that they are amenable and adaptive. PowerPoint Slidelayout Strategy Venn Diagram PPT Backgrounds-These high quality powerpoint pre-designed slides and powerpoint templates have been carefully created by our professional team to help you impress your audience. All slides have been created and are 100% editable in powerpoint. Each and every property of any graphic - color, size, orientation, shading, outline etc. can be modified to help you build an effective powerpoint presentation. Any text can be entered at any point in the powerpoint template or slide. Simply DOWNLOAD, TYPE and PRESENT! It is time to say farewell to failure. Our PowerPoint Slidelayout Strategy Venn Diagram Ppt Backgrounds assure achievement. Dwell on your exploits with our PowerPoint Slidelayout Strategy Venn Diagram Ppt Backgrounds. Bring out the courage of your actions. PowerPoint Backgrounds Image Triangle Puzzle PPT Layouts-These high quality, editable pre-designed powerpoint slides have been carefully created by our professional team to help you impress your audience. Each graphic in every slide is vector based and is 100% editable in powerpoint. Each and every property of any slide - color, size, shading etc can be modified to build an effective powerpoint presentation. Use these slides to convey complex business concepts in a simplified manner. Any text can be entered at any point in the powerpoint slide. Simply DOWNLOAD, TYPE and PRESENT! Have some fun with our PowerPoint Backgrounds Image Triangle Puzzle Ppt Layouts. They make creating ideas enjoyable. Decide your own fate with our PowerPoint Backgrounds Image Triangle Puzzle Ppt Layouts. Create your destiny with your thoughts. PowerPoint Designs Diagram Triangle Puzzle PPT Templates-These high quality powerpoint pre-designed slides and powerpoint templates have been carefully created by our professional team to help you impress your audience. All slides have been created and are 100% editable in powerpoint. Each and every property of any graphic - color, size, orientation, shading, outline etc. can be modified to help you build an effective powerpoint presentation. Any text can be entered at any point in the powerpoint template or slide. Simply DOWNLOAD, TYPE and PRESENT!" 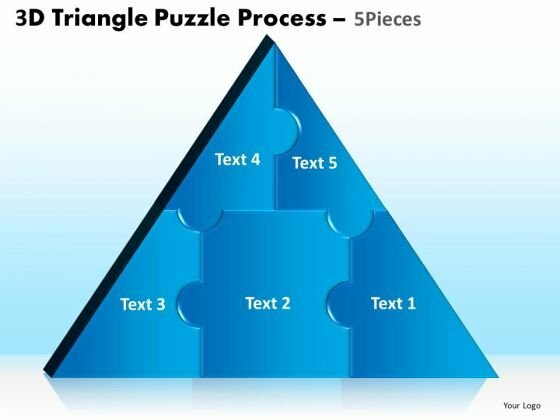 The people behind our PowerPoint Designs Diagram Triangle Puzzle Ppt Templates are an erudite lot. They are known to be very well read. 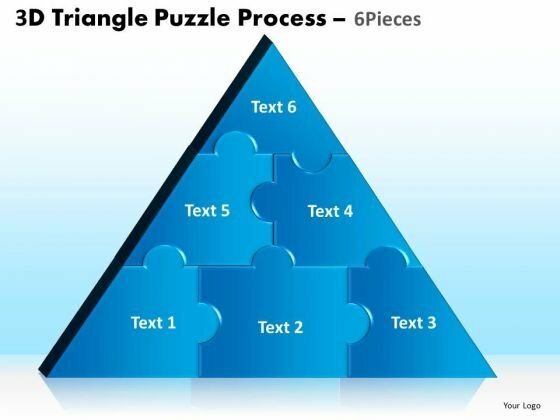 Our PowerPoint Designs Diagram Triangle Puzzle Ppt Templates always show a full face. Get a complete view from any angle. 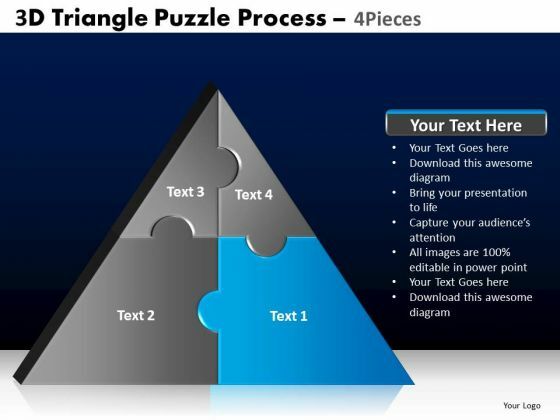 PowerPoint Slidelayout Image Triangle Puzzle PPT Template-These high quality powerpoint pre-designed slides and powerpoint templates have been carefully created by our professional team to help you impress your audience. All slides have been created and are 100% editable in powerpoint. Each and every property of any graphic - color, size, orientation, shading, outline etc. can be modified to help you build an effective powerpoint presentation. Any text can be entered at any point in the powerpoint template or slide. Simply DOWNLOAD, TYPE and PRESENT!" Meet your audience on equal terms. 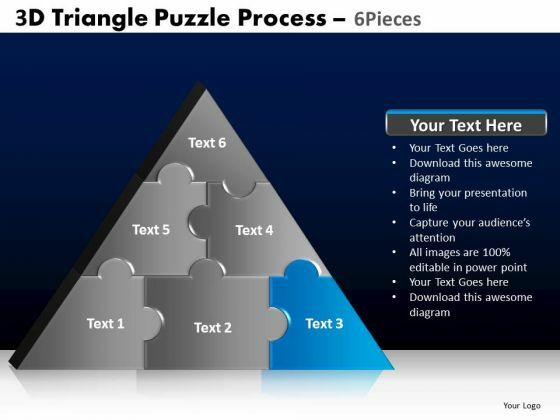 Level the field with our PowerPoint Slidelayout Image Triangle Puzzle Ppt Template. Cross continents with our PowerPoint Slidelayout Image Triangle Puzzle Ppt Template. Your thoughts will cover the earth. PowerPoint Backgrounds Global Triangle Puzzle PPT Designs-These amazing PowerPoint pre-designed slides and PowerPoint templates have been carefully created by our team of experts to help you impress your audience. Our stunning collection of Powerpoint slides are 100% editable and can easily fit in any PowerPoint presentations. By using these animations and graphics in PowerPoint and you can easily make professional presentations. Any text can be entered at any point in the PowerPoint template or slide. Just DOWNLOAD our awesome PowerPoint templates and you are ready to go. Get directly to the point with our PowerPoint Backgrounds Global Triangle Puzzle Ppt Designs. Dont pass up this opportunity to shine. Our PowerPoint Backgrounds Global Triangle Puzzle Ppt Designs are designed to excite. Your thoughts will cause much delight. PowerPoint Layouts Process Triangle Puzzle PPT Themes-These amazing PowerPoint pre-designed slides and PowerPoint templates have been carefully created by our team of experts to help you impress your audience. Our stunning collection of Powerpoint slides are 100% editable and can easily fit in any PowerPoint presentations. By using these animations and graphics in PowerPoint and you can easily make professional presentations. Any text can be entered at any point in the PowerPoint template or slide. Just DOWNLOAD our awesome PowerPoint templates and you are ready to go. Fetch upto the dais with our PowerPoint Layouts Process Triangle Puzzle Ppt Themes. Take charge of the environment. Make it crystal clear with our PowerPoint Layouts Process Triangle Puzzle Ppt Themes. Confusion will never enter the door. 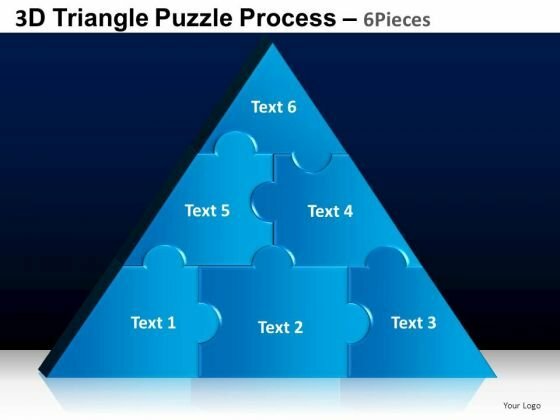 PowerPoint Presentation Download Triangle Puzzle PPT Template-These amazing PowerPoint pre-designed slides and PowerPoint templates have been carefully created by our team of experts to help you impress your audience. Our stunning collection of Powerpoint slides are 100% editable and can easily fit in any PowerPoint presentations. By using these animations and graphics in PowerPoint and you can easily make professional presentations. Any text can be entered at any point in the PowerPoint template or slide. Just DOWNLOAD our awesome PowerPoint templates and you are ready to go. 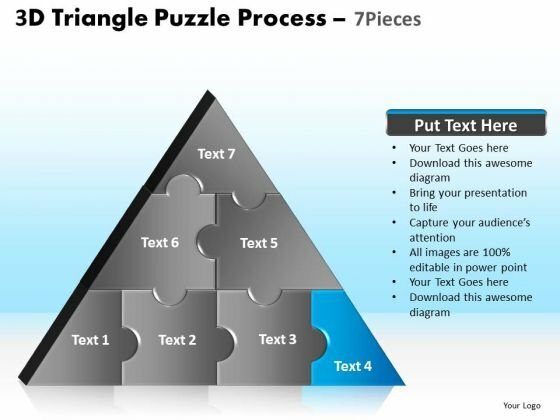 Putit on our PowerPoint Presentation Download Triangle Puzzle Ppt Template. It's as good as putting it on file. Achieve strategic & tactical operations with our PowerPoint Presentation Download Triangle Puzzle Ppt Template. They will make you look good. PowerPoint Templates Strategy Triangle Puzzle PPT Slide-These amazing PowerPoint pre-designed slides and PowerPoint templates have been carefully created by our team of experts to help you impress your audience. Our stunning collection of Powerpoint slides are 100% editable and can easily fit in any PowerPoint presentations. By using these animations and graphics in PowerPoint and you can easily make professional presentations. Any text can be entered at any point in the PowerPoint template or slide. Just DOWNLOAD our awesome PowerPoint templates and you are ready to go. 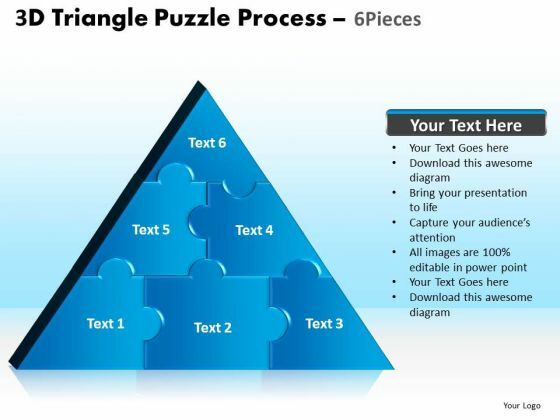 Be a winner with our PowerPoint Templates Strategy Triangle Puzzle Ppt Slide. You will come out on top. 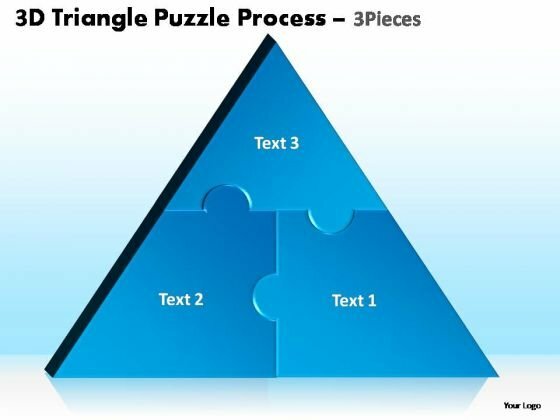 Our PowerPoint Templates Strategy Triangle Puzzle Ppt Slide are associated with ambition. They encourage you to dream big. PowerPoint Layouts Education Triangle Puzzle PPT Slide-These amazing PowerPoint pre-designed slides and PowerPoint templates have been carefully created by our team of experts to help you impress your audience. Our stunning collection of Powerpoint slides are 100% editable and can easily fit in any PowerPoint presentations. By using these animations and graphics in PowerPoint and you can easily make professional presentations. Any text can be entered at any point in the PowerPoint template or slide. Just DOWNLOAD our awesome PowerPoint templates and you are ready to go. Make it crystal clear with our PowerPoint Layouts Education Triangle Puzzle Ppt Slide. Confusion will never enter the door. Our PowerPoint Layouts Education Triangle Puzzle Ppt Slide believe in fidelity. They will abide by your faith in them. PowerPoint Presentation Round Chart Sales PPT Themes-This PowerPoint Diagram represents the Round Sales Chart in which four different approaches which results in one common Outcome. It Imitates the concept of Teamwork as they are inter-related to each other.-PowerPoint Presentation Round Chart Sales PPT Themes Tick through all the factors involved. 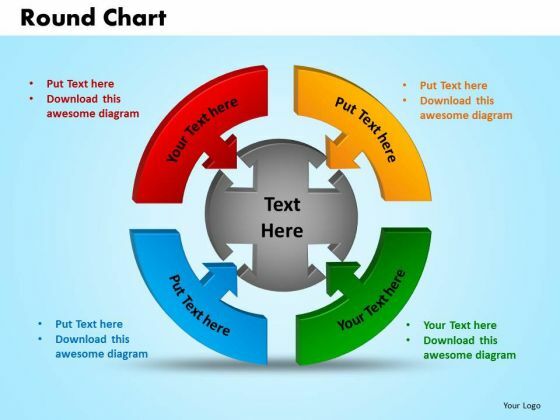 Check it down with our PowerPoint Presentation Round Chart Sales Ppt Themes. Crack the code with our PowerPoint Presentation Round Chart Sales Ppt Themes. Your thoughts will decipher it for the audience. Business PPT Background linear arrows 10 stages communication powerpoint Image-This linear arrow diagram provides a systematic approach to business development process.Strengthen your relationship with your present customers and likely future ones as the occasion has an intrinsic business potential.-Business PPT Background linear arrows 10 stages communication powerpoint Image-Aim, Angle, Arrow, Arrowheads, Badge, Banner, Connection, Curve, Design, Direction, Download, Element, Fuchsia, Icon, Illustration, Indicator, Internet, Label, Link, Magenta, Mark, Marker, Next, Object, Orange, Orientation, Pointer, Shadow, Shape, Signs Symbol Correct the errant with our Business Ppt Background Linear Arrows 10 Stages Communication PowerPoint Image. They will willingly accept your advice. Go get 'em with our Business Ppt Background Linear Arrows 10 Stages Communication PowerPoint Image.Be sure there will be no false bravado. editable PowerPoint template linear arrows 7 stages operations management Graphic-You know your business and have a vision for it. Use this diagram to show how one can contribute to it. Lead the way to spread good cheer to one and all. Designed to attract the attention of your audience-editable PowerPoint template linear arrows 7 stages operations management Graphic-Aim, Angle, Arrow, Arrowheads, Badge, Banner, Connection, Curve, Design, Direction, Download, Element, Fuchsia, Icon, Illustration, Indicator, Internet, Label, Link, Magenta, Mark, Marker, Next, Object, Orange, Orientation, Pointer, Shadow, Shape, Signs Symbol Do it better than the best. Our Editable PowerPoint Template Linear Arrows 7 Stages Operations Management Graphic do it exceedingly well. Keep them enthused with our Editable PowerPoint Template Linear Arrows 7 Stages Operations Management Graphic. You will come out on top. editable PPT linear arrows 11 state diagram time management powerpoint 7 Image-Original thinking is the need of the hour. We provide the means to project your views. Present your views using our innovative slides and are assured of leaving a lasting impression.-editable PPT linear arrows 11 state diagram time management powerpoint 7 Image-Aim, Angle, Arrow, Arrowheads, Badge, Banner, Connection, Curve, Design, Direction, Download, Element, Fuchsia, Icon, Illustration, Indicator, Internet, Label, Link, Magenta, Mark, Marker, Next, Object, Orange, Orientation, Pointer, Shadow, Shape, Signs Symbol Call on the expertise of our Editable Ppt Linear Arrows 11 State Diagram Time Management PowerPoint 7 Image team. Experience excellence in their every design. There is one thing our Editable Ppt Linear Arrows 11 State Diagram Time Management PowerPoint 7 Image cannot do. They cannot be drab and dreary. editable PPT Theme linear arrows 9 states diagram project management powerpoint Image-This diagram is a simple mapping tool that shows the sequence of actions within a process. Use this diagram to develop the teams vision of where they need to be in the future.-editable PPT Theme linear arrows 9 states diagram project management powerpoint Image-Aim, Angle, Arrow, Arrowheads, Badge, Banner, Connection, Curve, Design, Direction, Download, Element, Fuchsia, Icon, Illustration, Indicator, Internet, Label, Link, Magenta, Mark, Marker, Next, Object, Orange, Orientation, Pointer, Shadow, Shape, Signs Symbol Break out of the cocoon with our Editable Ppt Theme Linear Arrows 9 States Diagram Project Management PowerPoint Image. Let your thoughts take to the air. Formulate plans with our Editable Ppt Theme Linear Arrows 9 States Diagram Project Management PowerPoint Image. Download without worries with our money back guaranteee. flow PowerPoint template linear arrows 7 stages communication skills design-The above template contains a graphic of Pointing Arrow containing 7 stages This image has been conceived to enable you to emphatically communicate your ideas in Chop and change with our Flow PowerPoint Template Linear Arrows 7 Stages Communication Skills Design. Make alterations with alacrity. Advocate your ideas with our Flow PowerPoint Template Linear Arrows 7 Stages Communication Skills Design. The audience will admire your fervour. flow PowerPoint template linear ppt arrows 11 states diagram 12 design-This image has been professionally designed to emphasize the concept of interconnected relationships. You can easily edit the size, position and text and change the colors as per your need. 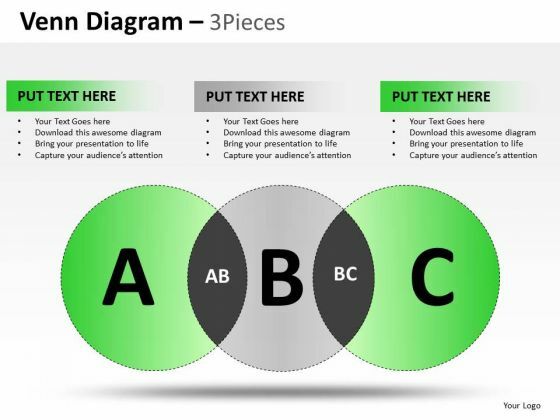 Deliver amazing presentations to mesmerize your audience.-flow PowerPoint template linear ppt arrows 11 states diagram 12 design-Aim, Angle, Arrow, Arrowheads, Badge, Banner, Connection, Curve, Design, Direction, Download, Element, Fuchsia, Icon, Illustration, Indicator, Internet, Label, Link, Magenta, Mark, Marker, Next, Object, Orange, Orientation, Pointer, Shadow, Shape, Signs Symbol Employ creativity with our Flow PowerPoint Template Linear Ppt Arrows 11 States Diagram 12 Design. You will come out on top. Our Flow PowerPoint Template Linear Ppt Arrows 11 States Diagram 12 Design are actually endearing. Their efforts to please are the best by far. flow PPT Background linear arrows 9 stages operations management powerpoint 2 design-This diagram is aesthetically designed to make a great first impression this template highlights stages of a process. you can easily edit the size, position and text and change the colors as per your need. Deliver amazing presentations to mesmerize your audience.-flow PPT Background linear arrows 9 stages operations management powerpoint 2 design-Aim, Angle, Arrow, Arrowheads, Badge, Banner, Connection, Curve, Design, Direction, Download, Element, Fuchsia, Icon, Illustration, Indicator, Internet, Label, Link, Magenta, Mark, Marker, Next, Object, Orange, Orientation, Pointer, Shadow, Shape, Signs Symbol You have envisaged a bright future for your organisation. Deliver your forecast on our Flow Ppt Background Linear Arrows 9 Stages Operations Management PowerPoint 2 Design. Our Flow Ppt Background Linear Arrows 9 Stages Operations Management PowerPoint 2 Design don't fib about. They display factual conditions. flow PPT Background linear arrows 9 stages operations management powerpoint 3 design-Use this diagram to keep track of business activities. It helps you to organize the logic of your views. This Diagram is designed to attract the attention of your audience. You can easily edit the size, position and text and change the colors as per your need.-flow PPT Background linear arrows 9 stages operations management powerpoint 3 design-Aim, Angle, Arrow, Arrowheads, Badge, Banner, Connection, Curve, Design, Direction, Download, Element, Fuchsia, Icon, Illustration, Indicator, Internet, Label, Link, Magenta, Mark, Marker, Next, Object, Orange, Orientation, Pointer, Shadow, Shape, Signs Symbol Get people out of bed with our Flow Ppt Background Linear Arrows 9 Stages Operations Management PowerPoint 3 Design. Just download, type and present. Achieve the fame you aspire to. Our Flow Ppt Background Linear Arrows 9 Stages Operations Management PowerPoint 3 Design will make it a certainty. flow PPT linear arrows 11 states diagram project management powerpoint 9 Graphic-This Linear arrow template helps expound on the logic of your detailed thought process to take your company forward. Break it all down to Key Result Areas. Motivate your team to cross all barriers-flow PPT linear arrows 11 states diagram project management powerpoint 9 Graphic-Aim, Angle, Arrow, Arrowheads, Badge, Banner, Connection, Curve, Design, Direction, Download, Element, Fuchsia, Icon, Illustration, Indicator, Internet, Label, Link, Magenta, Mark, Marker, Next, Object, Orange, Orientation, Pointer, Shadow, Shape, Signs Symbol Motivate your team to excellent performances. Nurture their abilities through our Flow Ppt Linear Arrows 11 States Diagram Project Management PowerPoint 9 Graphic. Our Flow Ppt Linear Arrows 11 States Diagram Project Management PowerPoint 9 Graphic believe in fidelity. They will abide by your faith in them. flow PPT linear arrows 12 states diagram project management powerpoint Graphic-Use this diagram to display the direction of the specific activities involved and how to put these in a proper manner for achieving the desired goal. This slide is an excellent backdrop for you to enlighten your audience on the process you have gone through and the vision you have for the future.-flow PPT linear arrows 12 states diagram project management powerpoint Graphic-Aim, Angle, Arrow, Arrowheads, Badge, Banner, Connection, Curve, Design, Direction, Download, Element, Fuchsia, Icon, Illustration, Indicator, Internet, Label, Link, Magenta, Mark, Marker, Next, Object, Orange, Orientation, Pointer, Shadow, Shape, Signs Symbol Keep it coming with our Flow Ppt Linear Arrows 12 States Diagram Project Management PowerPoint Graphic. Your thoughts will continue ad infinitum. Meet your audience on equal terms. Level the field with our Flow Ppt Linear Arrows 12 States Diagram Project Management PowerPoint Graphic. 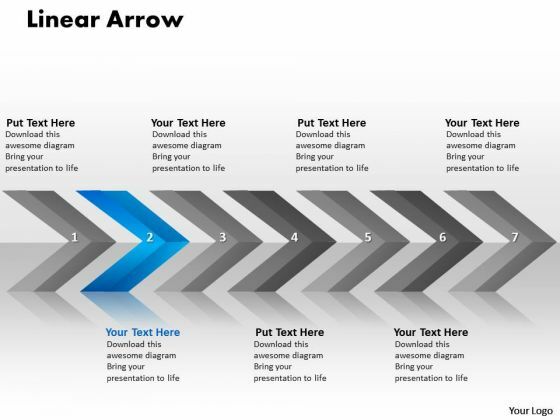 Business PowerPoint template linear arrows 10 stages plan business Image-Use this diagram to put all your brilliant views to your audience. Step by step develop the entire picture and project it onto their minds. Communicate your concerns and educate your team along the path to success. Guaranteed to focus the minds of your team.-Business PowerPoint template linear arrows 10 stages plan business Image-Aim, Angle, Arrow, Arrowheads, Badge, Banner, Connection, Curve, Design, Direction, Download, Element, Fuchsia, Icon, Illustration, Indicator, Internet, Label, Link, Magenta, Mark, Marker, Next, Object, Orange, Orientation, Pointer, Shadow, Shape, Signs Symbol Our Business PowerPoint Template Linear Arrows 10 Stages Plan Business Image make excellent accessories. Your thoughts will don that designer look. The worth of our Business PowerPoint Template Linear Arrows 10 Stages Plan Business Image is self evident. Their ability is there for all to see. 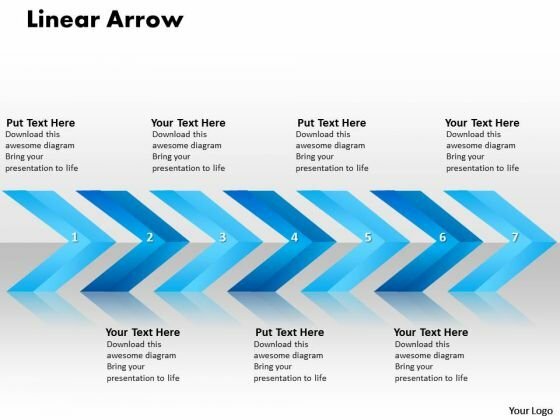 Business PowerPoint template linear arrows 10 stages plan Image- The above template has the theme of linear arrows. Use this diagram to highlight the important timelines and milestones of this exciting journey. Focus the light on the path to sure shot success. It enhances the essence of your viable ideas-Business PowerPoint template linear arrows 10 stages plan Image-Aim, Angle, Arrow, Arrowheads, Badge, Banner, Connection, Curve, Design, Direction, Download, Element, Fuchsia, Icon, Illustration, Indicator, Internet, Label, Link, Magenta, Mark, Marker, Next, Object, Orange, Orientation, Pointer, Shadow, Shape, Signs Symbol Enhance feasibility with our Business PowerPoint Template Linear Arrows 10 Stages Plan Image. Exhort your team to eventual success. 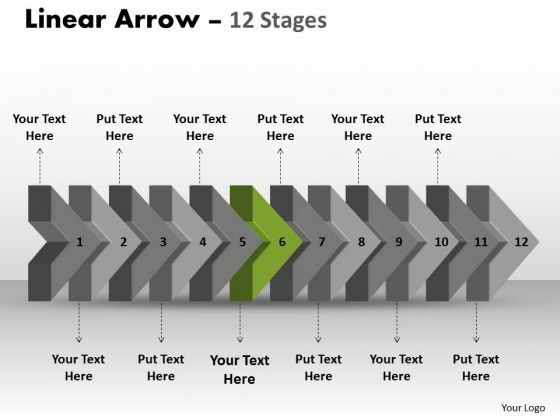 Clear the dust with our Business PowerPoint Template Linear Arrows 10 Stages Plan Image. Deliver your ideas in a clear environment. Business PPT linear arrows 12 power point stages management powerpoint 5 Image-Use this diagram to arrange steps in such a manner that the preceding phase must be cleared before moving to next phase. Expound on better diagnostic processes for a more accurate analysis and control of the ailment to increase chances of a permanent cure.-Business PPT linear arrows 12 power point stages management powerpoint 5 Image-Aim, Angle, Arrow, Arrowheads, Badge, Banner, Connection, Curve, Design, Direction, Download, Element, Fuchsia, Icon, Illustration, Indicator, Internet, Label, Link, Magenta, Mark, Marker, Next, Object, Orange, Orientation, Pointer, Shadow, Shape, Signs Symbol Execute plans with our Business Ppt Linear Arrows 12 Power Point Stages Management PowerPoint 5 Image. Download without worries with our money back guaranteee. Restore faith with our Business Ppt Linear Arrows 12 Power Point Stages Management PowerPoint 5 Image. Download without worries with our money back guaranteee. Business PPT linear arrows 12 power point stages management powerpoint 6 Image-Adjust the above image into your Presentations to visually support your contents. Outline the path you have in mind in order to boost sales and stay ahead of the competition enhancing your corporate reputation as you go along the road to success.-Business PPT linear arrows 12 power point stages management powerpoint 6 Image-Aim, Angle, Arrow, Arrowheads, Badge, Banner, Connection, Curve, Design, Direction, Download, Element, Fuchsia, Icon, Illustration, Indicator, Internet, Label, Link, Magenta, Mark, Marker, Next, Object, Orange, Orientation, Pointer, Shadow, Shape, Signs Symbol Beget approval with our Business Ppt Linear Arrows 12 Power Point Stages Management PowerPoint 6 Image. The audience will find your plans exceedingly good. Award yourself with our Business Ppt Linear Arrows 12 Power Point Stages Management PowerPoint 6 Image. You deserve to deal with the best. Business PPT template linear arrows 11 stages time management powerpoint 2 Graphic-Use this diagram to your advantage to priorities your ideas. This slide is an excellent backdrop for you to enlighten your audience on the process you have gone through and the vision you have for the future.-Business PPT template linear arrows 11 stages time management powerpoint 2 Graphic-Aim, Angle, Arrow, Arrowheads, Badge, Banner, Connection, Curve, Design, Direction, Download, Element, Fuchsia, Icon, Illustration, Indicator, Internet, Label, Link, Magenta, Mark, Marker, Next, Object, Orange, Orientation, Pointer, Shadow, Shape, Signs Symbol Get the value of a lifetime with our Business Ppt Template Linear Arrows 11 Stages Time Management PowerPoint 2 Graphic. Dont waste time struggling with PowerPoint. Let us do it for you. Cultivate the audience with our Business Ppt Template Linear Arrows 11 Stages Time Management PowerPoint 2 Graphic. The bond between you will grow. Business PPT template linear arrows 11 stages time management powerpoint 3 Graphic-You have the process in your head, our template design showing Linear arrows will illuminate your thoughts. Blaze a brilliant trail from point to point. Our PowerPoint templates are designed for your ideas to sell.-Business PPT template linear arrows 11 stages time management powerpoint 3 Graphic-Aim, Angle, Arrow, Arrowheads, Badge, Banner, Connection, Curve, Design, Direction, Download, Element, Fuchsia, Icon, Illustration, Indicator, Internet, Label, Link, Magenta, Mark, Marker, Next, Object, Orange, Orientation, Pointer, Shadow, Shape, Signs Symbol Augment your assets with our Business Ppt Template Linear Arrows 11 Stages Time Management PowerPoint 3 Graphic. They have many desirable attributes. Our Business Ppt Template Linear Arrows 11 Stages Time Management PowerPoint 3 Graphic exemplify capability. Think of it and they can do it. Business PPT Theme linear arrows 11 power point stage strategy powerpoint 8 Graphic-Use these Linear Arrows to Illustrate Processes Step by Step in PowerPoint Presentations. This diagram has the unique ability to drive home your ideas and show how they mesh to guarantee success.-Business PPT Theme linear arrows 11 power point stage strategy powerpoint 8 Graphic-Aim, Angle, Arrow, Arrowheads, Badge, Banner, Connection, Curve, Design, Direction, Download, Element, Fuchsia, Icon, Illustration, Indicator, Internet, Label, Link, Magenta, Mark, Marker, Next, Object, Orange, Orientation, Pointer, Shadow, Shape, Signs Symbol Alert your team to possibilities with our Business Ppt Theme Linear Arrows 11 Power Point Stage Strategy PowerPoint 8 Graphic. You will come out on top. There are no mixed feelings about our Business Ppt Theme Linear Arrows 11 Power Point Stage Strategy PowerPoint 8 Graphic. They are a definite asset for all. editable PowerPoint template linear arrows 7 stages operations management business Graphic-Use this diagram to evolve the strategy to take you down the required path with appropriate, efficient and effective marketing along the way. Give an overview of your capability and insight into the minute details of the overall picture highlighting the interdependence at every operational level.-editable PowerPoint template linear arrows 7 stages operations management business Graphic-Aim, Angle, Arrow, Arrowheads, Badge, Banner, Connection, Curve, Design, Direction, Download, Element, Fuchsia, Icon, Illustration, Indicator, Internet, Label, Link, Magenta, Mark, Marker, Next, Object, Orange, Orientation, Pointer, Shadow, Shape, Signs Symbol Deal with matters in an equitable way. Reach a settlement with the help of our Editable PowerPoint Template Linear Arrows 7 Stages Operations Management Business Graphic. Make a clean presentation with our Editable PowerPoint Template Linear Arrows 7 Stages Operations Management Business Graphic. You will be at the top of your game. flow PPT Theme linear arrows 12 phase diagram time management powerpoint 3 Image-Develop competitive advantage with our above template which contains a series of directional arrows that show what path to follow. Develop your marketing strategy and communicate your enthusiasm and motivation to raise the bar.-flow PPT Theme linear arrows 12 phase diagram time management powerpoint 3 Image-Aim, Angle, Arrow, Arrowheads, Badge, Banner, Connection, Curve, Design, Direction, Download, Element, Fuchsia, Icon, Illustration, Indicator, Internet, Label, Link, Magenta, Mark, Marker, Next, Object, Orange, Orientation, Pointer, Shadow, Shape, Signs Symbol No matter how far flung your clientele is. Connect with them all through our Flow Ppt Theme Linear Arrows 12 Phase Diagram Time Management PowerPoint 3 Image. Fastidious conditions egg us on. Our Flow Ppt Theme Linear Arrows 12 Phase Diagram Time Management PowerPoint 3 Image team exult in challenges. flow PPT Theme linear arrows 12 phase diagram time management powerpoint 4 Image-This diagram can be used as an analysis graph designed to help you understand the cause-and-effect relationships of your key processes. It provides a specialist tool to resolve problems and define the appropriate actions for the responsible team.-flow PPT Theme linear arrows 12 phase diagram time management powerpoint 4 Image-Aim, Angle, Arrow, Arrowheads, Badge, Banner, Connection, Curve, Design, Direction, Download, Element, Fuchsia, Icon, Illustration, Indicator, Internet, Label, Link, Magenta, Mark, Marker, Next, Object, Orange, Orientation, Pointer, Shadow, Shape, Signs Symbol Surpass your colleagues with our Flow Ppt Theme Linear Arrows 12 Phase Diagram Time Management PowerPoint 4 Image. Download without worries with our money back guaranteee. Consider your promotion a surety with our Flow Ppt Theme Linear Arrows 12 Phase Diagram Time Management PowerPoint 4 Image. You will come out on top. marketing PowerPoint template Linear arrows 12 stages time management business design-This diagram can help you to define a strategy and measure performance against goals, monitor progress on a regular basis and communicate across your entire enterprise.-marketing PowerPoint template Linear arrows 12 stages time management business design-Aim, Angle, Arrow, Arrowheads, Badge, Banner, Connection, Curve, Design, Direction, Download, Element, Fuchsia, Icon, Illustration, Indicator, Internet, Label, Link, Magenta, Mark, Marker, Next, Object, Orange, Orientation, Pointer, Shadow, Shape, Signs Symbol Deliver success with our Marketing PowerPoint Template Linear Arrows 12 Stages Time Management Business Design. Download without worries with our money back guaranteee. Secure your promotion with our Marketing PowerPoint Template Linear Arrows 12 Stages Time Management Business Design. Download without worries with our money back guaranteee. 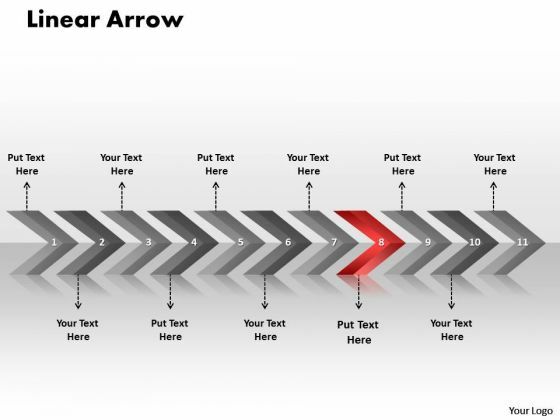 marketing PowerPoint template Linear arrows 12 stages time management design-Adjust the above image into your Presentations to visually support your contents and use it across the organization to guarantee that everyone is working with the same definitions and toward the same targets.-marketing PowerPoint template Linear arrows 12 stages time management design-Aim, Angle, Arrow, Arrowheads, Badge, Banner, Connection, Curve, Design, Direction, Download, Element, Fuchsia, Icon, Illustration, Indicator, Internet, Label, Link, Magenta, Mark, Marker, Next, Object, Orange, Orientation, Pointer, Shadow, Shape, Signs Symbol Our Marketing PowerPoint Template Linear Arrows 12 Stages Time Management Design have a enabling effect. They allow youto act as per your choice. Our Marketing PowerPoint Template Linear Arrows 12 Stages Time Management Design take you from "concept to can". Make theprocess an amazing one. 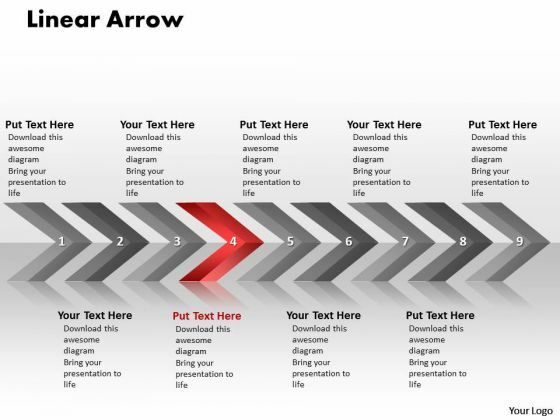 marketing PPT linear arrows 10 stages business communication powerpoint 8 Image-This Linear Arrow design provides a graphic tool that allows users to easily draft the strategy map and monitor performance through the same. Use this impressive template to unravel your recipe for a mouth watering result.-marketing PPT linear arrows 10 stages business communication powerpoint 8 Image-Aim, Angle, Arrow, Arrowheads, Badge, Banner, Connection, Curve, Design, Direction, Download, Element, Fuchsia, Icon, Illustration, Indicator, Internet, Label, Link, Magenta, Mark, Marker, Next, Object, Orange, Orientation, Pointer, Shadow, Shape, Signs Symbol Spice up the discourse with our Marketing Ppt Linear Arrows 10 Stages Business Communication PowerPoint 8 Image. Strengthen the flavour of your thoughts. Display your enterprise with our Marketing Ppt Linear Arrows 10 Stages Business Communication PowerPoint 8 Image. Go boldly forth with your plans. marketing PPT linear arrows 10 stages business communication powerpoint 9 Image-The above diagram can facilitates the process of risk identification and analysis to guarantee the achievement of organizational objectives. Give an overview of your capability and insight into the minute details of the overall picture highlighting the interdependence at every operational level.-marketing PPT linear arrows 10 stages business communication powerpoint 9 Image-Aim, Angle, Arrow, Arrowheads, Badge, Banner, Connection, Curve, Design, Direction, Download, Element, Fuchsia, Icon, Illustration, Indicator, Internet, Label, Link, Magenta, Mark, Marker, Next, Object, Orange, Orientation, Pointer, Shadow, Shape, Signs Symbol Find the perfect fit with our Marketing Ppt Linear Arrows 10 Stages Business Communication PowerPoint 9 Image. Try us out and see what a difference our templates make. They consider you their father figure. 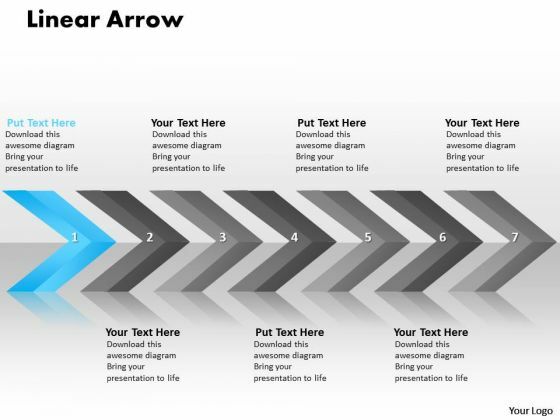 Deliver on their expectations with our Marketing Ppt Linear Arrows 10 Stages Business Communication PowerPoint 9 Image. marketing PPT linear arrows 12 power point stages communication skills powerpoint 8 Image-Develop competitive advantage with our above template which contains a diagram of pointed arrows. It helps expound on the logic of your detailed thought process to take your company forward. Break it all down to Key Result Areas. Motivate your team to cross all barriers-marketing PPT linear arrows 12 power point stages communication skills powerpoint 8 Image-Aim, Angle, Arrow, Arrowheads, Badge, Banner, Connection, Curve, Design, Direction, Download, Element, Fuchsia, Icon, Illustration, Indicator, Internet, Label, Link, Magenta, Mark, Marker, Next, Object, Orange, Orientation, Pointer, Shadow, Shape, Signs Symbol Energise your thoughts to fever pitch. Get them bubbling over with our Marketing Ppt Linear Arrows 12 Power Point Stages Communication Skills PowerPoint 8 Image. Our Marketing Ppt Linear Arrows 12 Power Point Stages Communication Skills PowerPoint 8 Image come in all colours, shades and hues. They help highlight the importance of your views. marketing PPT linear arrows 12 power point stages communication skills powerpoint 9 Image-Create visually amazing Microsoft office PPT Presentations with our above template. This premium graphics is especially suitable for sequences. It provides the means to project your views.-marketing PPT linear arrows 12 power point stages communication skills powerpoint 9 Image-Aim, Angle, Arrow, Arrowheads, Badge, Banner, Connection, Curve, Design, Direction, Download, Element, Fuchsia, Icon, Illustration, Indicator, Internet, Label, Link, Magenta, Mark, Marker, Next, Object, Orange, Orientation, Pointer, Shadow, Shape, Signs Symbol Make your ascent a delightful one. Give your career a booster dose with our Marketing Ppt Linear Arrows 12 Power Point Stages Communication Skills PowerPoint 9 Image. Disentangle the web with our Marketing Ppt Linear Arrows 12 Power Point Stages Communication Skills PowerPoint 9 Image. Seperate the various strands of thought. marketing PPT template Linear arrows 11 stages project management powerpoint 5 design-You have your finger on the pulse of your business and sense the need to re-align a bit. They are logical, accurate and to the point. Use this attractive template to emphasise your views.-marketing PPT template Linear arrows 11 stages project management powerpoint 5 design-Aim, Angle, Arrow, Arrowheads, Badge, Banner, Connection, Curve, Design, Direction, Download, Element, Fuchsia, Icon, Illustration, Indicator, Internet, Label, Link, Magenta, Mark, Marker, Next, Object, Orange, Orientation, Pointer, Shadow, Shape, Signs Symbol Carry your team with our Marketing Ppt Template Linear Arrows 11 Stages Project Management PowerPoint 5 Design. You will come out on top. No idea is too far fetched for our Marketing Ppt Template Linear Arrows 11 Stages Project Management PowerPoint 5 Design. They will help you think it through. marketing PPT template Linear arrows 11 stages project management powerpoint 6 design-This image has been conceived to enable you to emphatically communicate your ideas in Build on your charisma with our Marketing Ppt Template Linear Arrows 11 Stages Project Management PowerPoint 6 Design. Create a definite aura around you. You have fathereda great idea. Baptise it with our Marketing Ppt Template Linear Arrows 11 Stages Project Management PowerPoint 6 Design. marketing PPT Theme linear arrows 10 phase diagram business management powerpoint 2 Image-This Linear Arrows diagram is ideal choice for demonstrations of relations between processes in production, commercial activity or in marketing sphere. Could be use as universal tools for various presentations in a various topics.-marketing PPT Theme linear arrows 10 phase diagram business management powerpoint 2 Image-Aim, Angle, Arrow, Arrowheads, Badge, Banner, Connection, Curve, Design, Direction, Download, Element, Fuchsia, Icon, Illustration, Indicator, Internet, Label, Link, Magenta, Mark, Marker, Next, Object, Orange, Orientation, Pointer, Shadow, Shape, Signs Symbol Structure your thoughts with our Marketing Ppt Theme Linear Arrows 10 Phase Diagram Business Management PowerPoint 2 Image. Download without worries with our money back guaranteee. Earn the credits you do deserve. Answer the critics with our Marketing Ppt Theme Linear Arrows 10 Phase Diagram Business Management PowerPoint 2 Image. process PPT template linear arrows 10 stages operations management powerpoint 7 design-This arrow timeline diagram will be ideal choice for presentations on process, connections, steps, stages, projects, plans, tasks management, schedules, deadlines, milestones, annual reports, year planning, etc. Deliver amazing presentations to mesmerize your audience.-process PPT template linear arrows 10 stages operations management powerpoint 7 design-Aim, Angle, Arrow, Arrowheads, Badge, Banner, Connection, Curve, Design, Direction, Download, Element, Fuchsia, Icon, Illustration, Indicator, Internet, Label, Link, Magenta, Mark, Marker, Next, Object, Orange, Orientation, Pointer, Shadow, Shape, Signs Symbol Exhibit high fibre with our Process Ppt Template Linear Arrows 10 Stages Operations Management PowerPoint 7 Design. They display your fearless character. Drown doubts with our Process Ppt Template Linear Arrows 10 Stages Operations Management PowerPoint 7 Design. You will come out on top. process PPT Theme linear arrows 9 stages communication skills powerpoint 10 Graphic-This image has been conceived to enable you to emphatically communicate your ideas in Be a cross-functional expertise with our Process Ppt Theme Linear Arrows 9 Stages Communication Skills PowerPoint 10 Graphic. They will make you look good. Our Process Ppt Theme Linear Arrows 9 Stages Communication Skills PowerPoint 10 Graphic are never equivocal. They help you make a clear point. 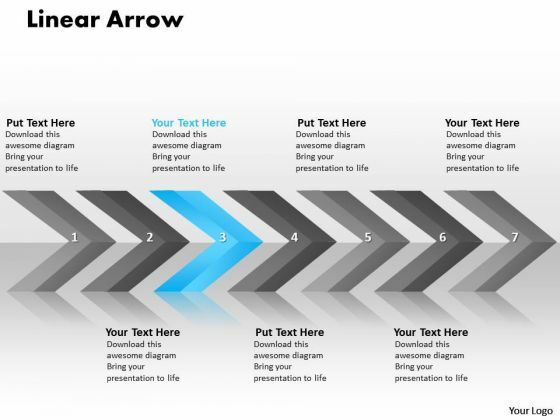 sales PowerPoint template linear arrows 9 stages project management business Graphic-Forward thinking is the way to go. Use our templates to emphasize your views. Stamp your authority with our Sales PowerPoint Template Linear Arrows 9 Stages Project Management Business Graphic. You will come out on top. Educate your team on avoiding accidents. Make out a checklist with the help of our Sales PowerPoint Template Linear Arrows 9 Stages Project Management Business Graphic. sales PowerPoint template linear arrows 9 stages project management Graphic-The vision of being the market leader is clear to you. Transmit your thoughts via this linear arrow PPT slide and prod your team to action. Motivate your team to cross all barriers-sales PowerPoint template linear arrows 9 stages project management Graphic-Aim, Angle, Arrow, Arrowheads, Badge, Banner, Connection, Curve, Design, Direction, Download, Element, Fuchsia, Icon, Illustration, Indicator, Internet, Label, Link, Magenta, Mark, Marker, Next, Object, Orange, Orientation, Pointer, Shadow, Shape, Signs Symbol Convert customers with our Sales PowerPoint Template Linear Arrows 9 Stages Project Management Graphic. Download without worries with our money back guaranteee. Question doubts with our Sales PowerPoint Template Linear Arrows 9 Stages Project Management Graphic. Download without worries with our money back guaranteee. 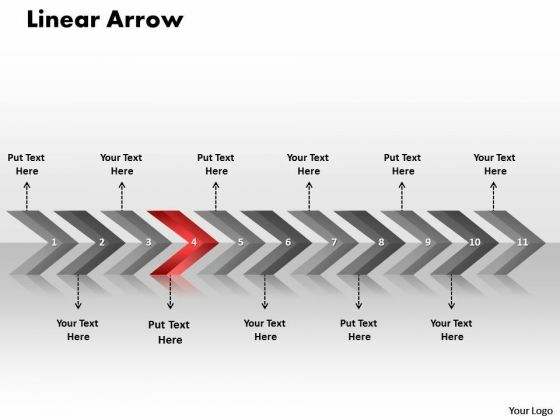 sales PPT Background linear arrows 7 stages business communication powerpoint 3 Image-Arrows Indicates the way to growth. Use this diagram for improved controls to drive your business towards the right direction. This Linear arrow diagram helps to focus the thoughts of your listeners-sales PPT Background linear arrows 7 stages business communication powerpoint 3 Image-Aim, Angle, Arrow, Arrowheads, Badge, Banner, Connection, Curve, Design, Direction, Download, Element, Fuchsia, Icon, Illustration, Indicator, Internet, Label, Link, Magenta, Mark, Marker, Next, Object, Orange, Orientation, Pointer, Shadow, Shape, Signs Symbol Bash on ahead with bold conviction. 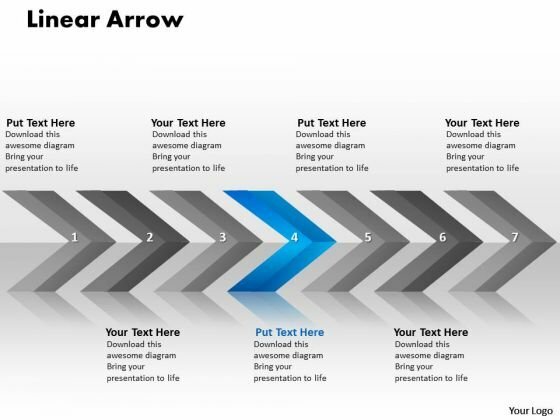 Have no fear with our Sales Ppt Background Linear Arrows 7 Stages Business Communication PowerPoint 3 Image. Correct wrongs with our Sales Ppt Background Linear Arrows 7 Stages Business Communication PowerPoint 3 Image. Download without worries with our money back guaranteee. sales PPT Background linear arrows 7 stages business communication powerpoint 4 Image-The arrows indicate the progression of the process. Use this diagram to unravel the desired and essential elements of your overall strategy. Explain the relevance of the different stages in getting down to ability and desired result.-sales PPT Background linear arrows 7 stages business communication powerpoint 4 Image-Aim, Angle, Arrow, Arrowheads, Badge, Banner, Connection, Curve, Design, Direction, Download, Element, Fuchsia, Icon, Illustration, Indicator, Internet, Label, Link, Magenta, Mark, Marker, Next, Object, Orange, Orientation, Pointer, Shadow, Shape, Signs Symbol Revise your plans with our Sales Ppt Background Linear Arrows 7 Stages Business Communication PowerPoint 4 Image. Download without worries with our money back guaranteee. Allow your thoughts to flow with our Sales Ppt Background Linear Arrows 7 Stages Business Communication PowerPoint 4 Image. They will develop your creative aptitude. We present our PPT Theme 3d illustration of straightaway arrow flow activity charts diagram 7 Image. Use our Arrows PowerPoint Templates because, Like your thoughts arrows are inherently precise and true. Use our Symbol PowerPoint Templates because; represent the progress in our lives. Use our Business PowerPoint Templates because, You have the process in your head, our template design showing will illuminate your thoughts. Use our Process and Flows PowerPoint Templates because, you have analyzed the illness and know the need. Use our Marketing PowerPoint Templates because, now fire the arrows to emblazon the desired path by which you will achieve anticipated results. Use these PowerPoint slides for presentations relating to Aim, Angle, Arrow, Arrowheads, Badge, Banner, Connection, Curve, Design, Direction, Download, Element, Fuchsia, Icon, Illustration, Indicator, Internet, Label, Link, Magenta, Mark, Marker, Next, Object, Orientation, Pointer, Shadow, Shape, Signs, Symbol. 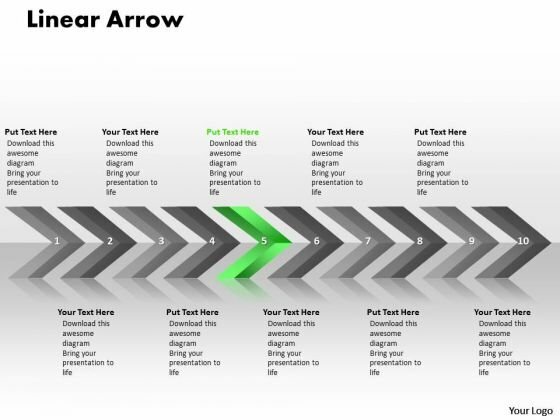 The prominent colors used in the PowerPoint template are Green, Gray, and Black Dare to dream with our Ppt Theme 3d Illustration Of Straightaway Arrow Flow Activity Charts Diagram 7 Image. You will come out on top. Orchestrate wins with our Ppt Theme 3d Illustration Of Straightaway Arrow Flow Activity Charts Diagram 7 Image. Download without worries with our money back guaranteee. We present our PPT Theme 3d illustration of straightaway arrow flow PowerPoint diagram 12 Image. 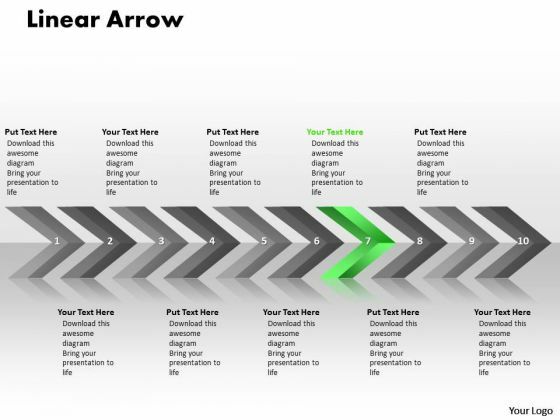 Use our Arrows PowerPoint Templates because, they enhance the essence of your viable ideas. Use our Symbol PowerPoint Templates because, the structure of our templates allows you to effectively highlight the key issues concerning the growth of your business. Use our Business PowerPoint Templates because, they pinpoint the core values of your organization. Use our Process and Flows PowerPoint Templates because, you understand the ailment and how to fight it. Use our Marketing PowerPoint Templates because; discuss each path to the smallest detail. Use these PowerPoint slides for presentations relating to Aim, Angle, Arrow, Arrowheads, Badge, Banner, Connection, Curve, Design, Direction, Download, Element, Fuchsia, Icon, Illustration, Indicator, Internet, Label, Link, Magenta, Mark, Marker, Next, Object, Orientation, Pointer, Shadow, Shape, Signs, Symbol. 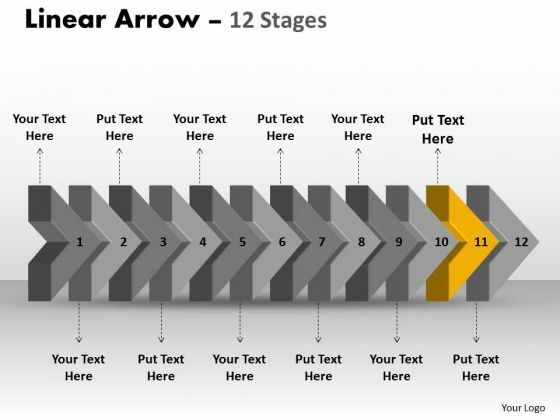 The prominent colors used in the PowerPoint template are Yellow, Gray, and Black Create the aroma with our Ppt Theme 3d Illustration Of Straightaway Arrow Flow PowerPoint Diagram 12 Image. Draw the crowds to your views. Help the audience digest your thoughts. Our Ppt Theme 3d Illustration Of Straightaway Arrow Flow PowerPoint Diagram 12 Image give you the facility.